As a leader in social policy and women’s rights, Margaret Mitchell put violence against women on the national agenda and played a critical role in having women recognized in the Charter of Rights and Freedoms. 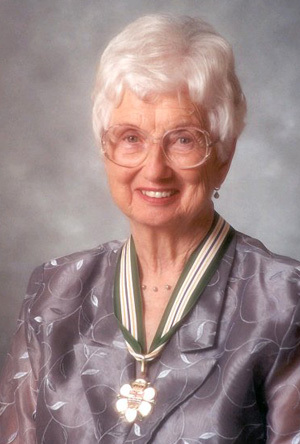 She pioneered community development in many Vancouver neighbourhoods helping to organize public housing, create opportunities for people on welfare. She is a strong advocate for minority rights and multiculturalism. Her outstanding work as a community development worker has inspired many social workers in B.C. to follow her path. Her book, Don’t Rest in Peace, Organize, has been a beacon for community mobilization and empowerment. As the Member of Parliament for Vancouver-East from 1979 to 1993 she voted against a pension increase for MPs and diverted her share of the increase to a special account to help the poorest in Vancouver’s downtown eastside. With her support, the Margaret Mitchell Fund for Women continues to grow and assist women’s organizations in East Vancouver dedicated to helping women help themselves in bettering their community. Her life has been dedicated to helping people, starting with her service with the Red Cross in Asia and Europe where she helped refugees from war in their time of dire need. Since her retirement from public service, she continues to serve British Columbia in many volunteer capacities, including being the first Chair of the BC Advisory Council on Human Rights.